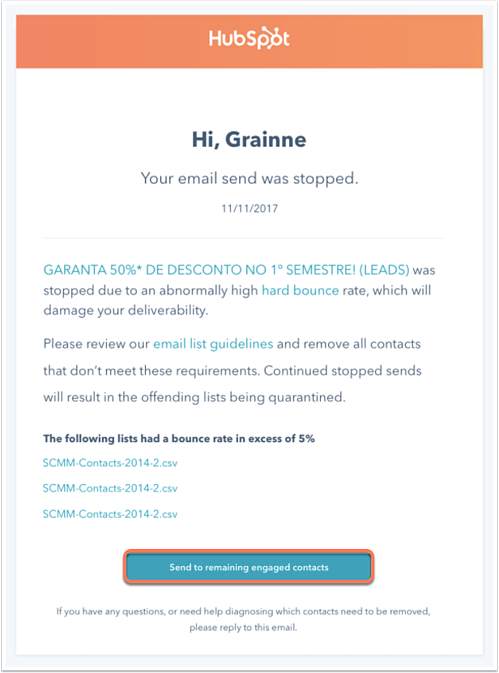 The sending of your marketing email might automatically be stopped before it is completed if your email starts to accumulate a high percentage of hard bounces, spam reports, or unsubscribes. Emails that result in high rates of hard bounces, spam complaints, and unsubscribe requests can have lasting negative effects on the deliverability of your future emails. Confirm that your list is OK to email with HubSpot. Make sure that you have imported all of your opt-out lists from other email systems into HubSpot. Remove any contacts from this list who haven't heard from you in over six months. Create an active list using the criteria Contact property | Last email send date | is more than 26 weeks ago and exclude the list from each of your email sends. When you receive the notification from HubSpot about your stopped email, you can click the Send to remaining engaged contacts button to send a clone of your original email to any remaining engaged contacts from your recipients list. This includes any contacts who have received, opened, or clicked one of your emails, or have opted in via a sign-up form. Clicking the Send to remaining engaged contacts button will bring you directly into the email editor of a clone of your original email that was stopped. This email clone will contain a new exclusion list in the recipients section to ensure that any unengaged contacts are dropped automatically when you re-send the message. Please note: if no contacts match the engagement criteria outlined above, the Send to remaining engaged contacts button will not be displayed in the email notification from HubSpot. Learn more about improving the deliverability of your emails.